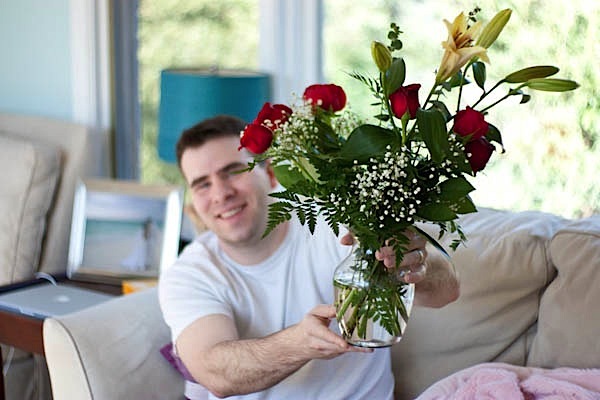 Check out the beautiful flowers hubby got me for Valentine’s Day! I can’t wait for all those lilies to bloom! 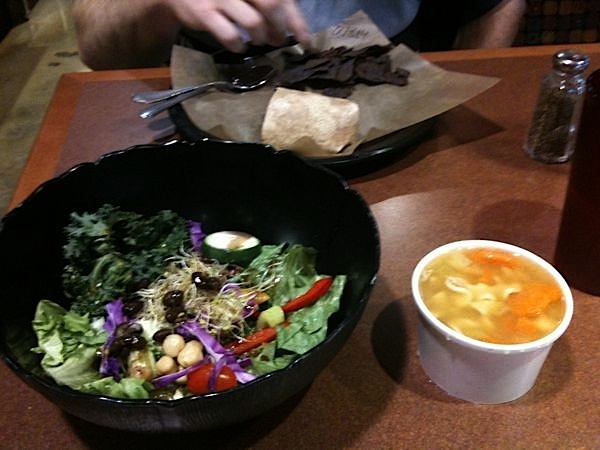 Hubby and I had a late lunch at Earthfare while we were out running errands. I had chicken noodle soup and salad. Then we took a pit stop at Barnes & Noble for some snackage and magazine browsing. 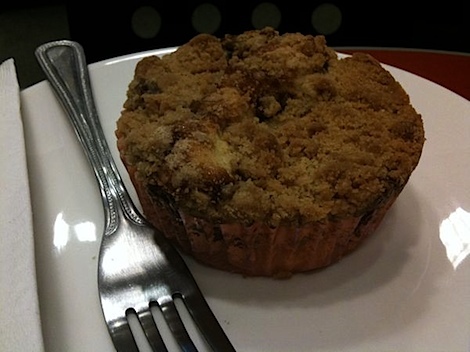 I had a bite of hubby’s coffee cake. It reminded me that I’ve been meaning to make a coffee cake from scratch some time. I’ve done a quick coffee cake before (click), but I want to do one NJ style next mirror. 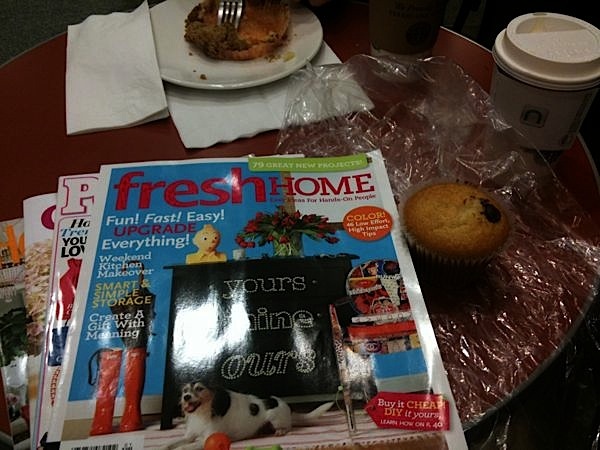 I actually snagged a vegan chocolate chip muffin from Earthfare before we headed to the book store. I don’t know if you do this, but when I find something I like, I look for it relentlessly, no matter the odds. I say odds, because for awhile I thought Earthfare had canned these delicious little muffins. One day I was seeing them there all the time, the next…no mas. 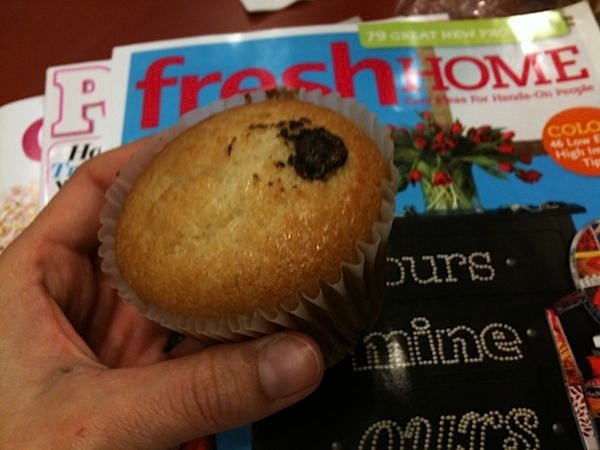 *sad face* Seriously, I’ve spent the last few months making sure to swing by the muffin case on my grocery trips to look for this little guy and for the last few months, I’ve been disappointed. But today, just as I was giving up on my scrumptious little treat, there it was! Score! Hubby and I were pretty tired today, so we did a cheat meal and got a rotisserie chicken for dinner from Earthfare. 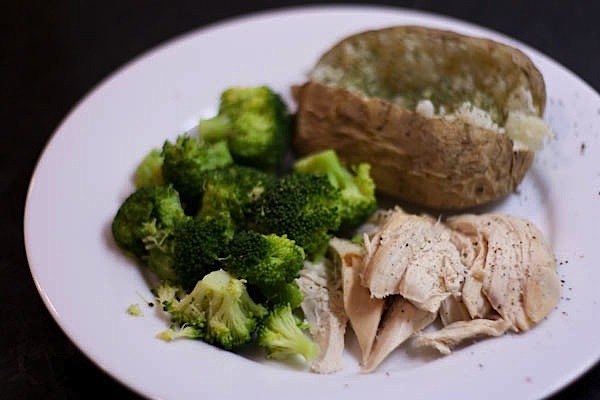 We also made micro-baked potatoes with butter and dried herbs, plus steamed organic broccoli with a drizzle of real butter. 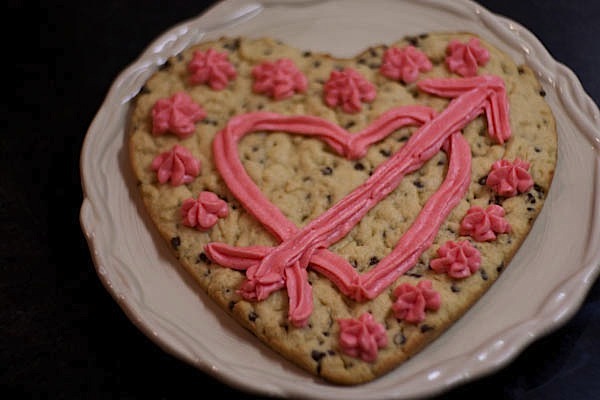 I know I said I was tired, but not too tired to bake something sweet for Valentine’s Day. I’ve been thinking a lot about cookie cakes lately…I don’t know why. But…I knew I just had to make one for V-day…heart-shaped of course. I also went for a Not So Sweet concoction because that’s how I roll. Ok, so this cookie cake serves more like 4 or 5 people. But, it’s large enough so as not to be confused with a regular cookie and smaller than your normal cookie cake. I made this using a Not So Sweet cookie base, though the chocolate chips and buttercream frosting definitely add a sweet kick here. While the cookie is less sweet than normal, I didn’t want to mess with the buttercream. I’m not sure a Not So Sweet buttercream would go over, though I do have some ideas using sucanat to test the waters. Be sure to set your butter out long enough in advance for your butter to come to room temperature…at least for the frosting part. You could probably microwave the butter to soften it a bit for the cookie base, but that won’t go over so well with the buttercream. Luckily, if you set the butter out when you start, by the time your cookie cake is baked and cooled, your butter should be close. 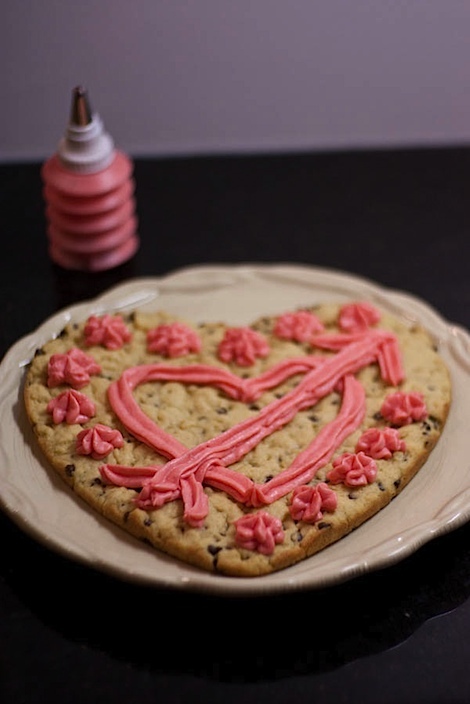 Pre-heat oven to 350 degrees F. Prepare a 9×12 heart-shaped cookie pan with non-stick spray. Line bottom with parchment paper and spray lightly on top of the paper. In a medium bowl, cream butter, brown sugar, and granulated sugar until light. Stir in egg and vanilla until well-combined. Add wet mixture to dry mixture and mix until just combined (incorporate all dry flour, but be careful to not overmix). It will look like there isn’t enough of the wet mixture, but be patient and carefully combine. Pour cookie dough into the baking pan and carefully press cookie dough into the bottom of the pan. It will be a very thin layer of dough. If you want, wet fingers and smooth dough. Bake for 12-14 minutes, until edges are lightly brown and a toothpick inserted into center comes out clean. Let cookie cake cool to room temperature and decorate with buttercream frosting, recipe following (see below). Cookie cake always makes me think of my friends Justin and Emily. When they got married, they had a traditional wedding cake AND a cookie cake because Justin loves them so much. It was the only time I’ve seen a cookie cake at a wedding…and it was awesome! Come to think of it, I’m pretty sure Justin always gets cookie cakes for his birthdays, too (even the ones on boats). This recipe makes just enough buttercream to decorate your Heart-Shaped Cookie Cake for Two. You may even have some leftover! I used a stand mixer to do the work, but you could use a hand held mixer or even do it by hand. Be sure to use the gel coloring recommended – the drop kind is too liquidy. You can get the gel color at stores selling cake decorating tools. I got mine from Michael’s. Starting on a low speed (so the sugar doesn’t go flying everywhere), whip sugar and butter together until just combined. Beat on medium speed until light and fluffy. Add milk, as needed, but in small increments, just until mixture comes together to desired texture. Use a toothpick to add a bit of gel color to frosting and mix in until evenly distributed. Repeat until frosting reaches desired color. 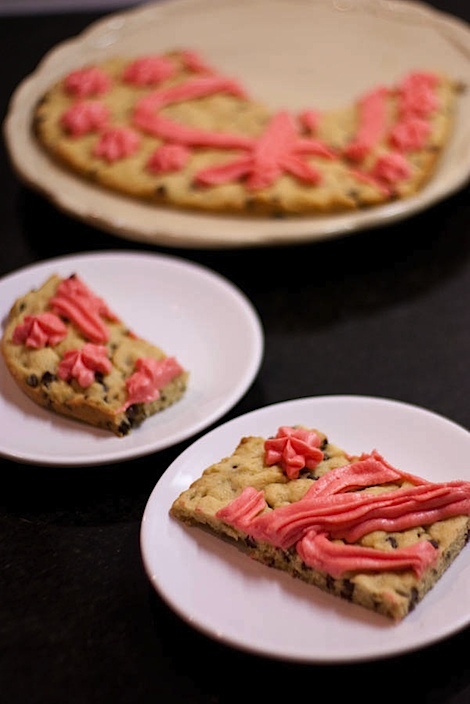 Put frosting into a decorating bag with tip or decorating-gun-tool and decorate cookie cake as desired. Do you prefer cake or cookie cake? 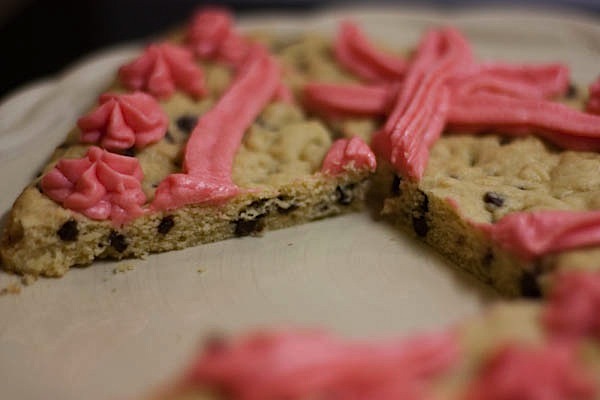 Mmmmm a DIY Mrs. Fields cookie cake. This could be dangerous! It sounds like you had a great day! 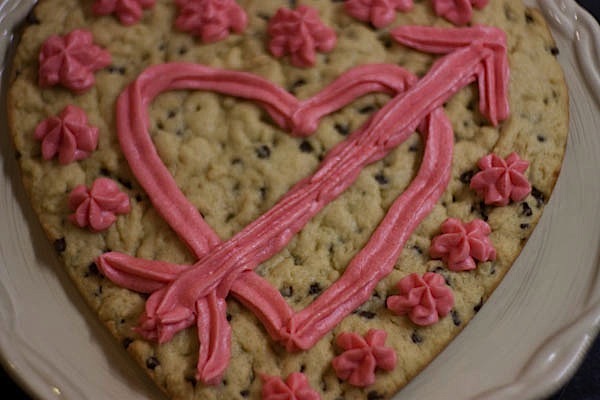 The heart shaped cookie is really cute! I’m pretty sure I’d end up eating the entire thing by myself if it was in my house! What a special day of yummy food and spending time with your man. And to top it off an adorable heart shaped cookie cake. Love it! 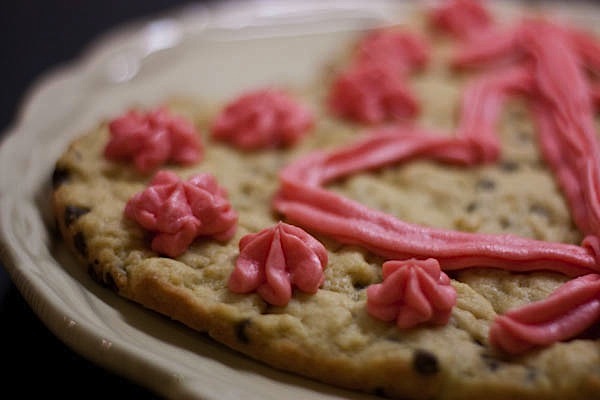 when i saw the cookie at the top, i thought, oh your husband bought it for you then bam … you made it. delicious! The cookie is super cute, great idea. For my boyfriend’s birthday, I made him an enormous cookie in a pie pan instead of a cake ;). Those flowers are gorgeous! Love the red roses. Definitely cookie cake. I’m not huge on anything too cakey or bready. 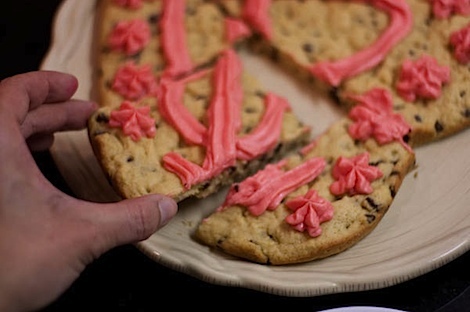 good call on the cookie cake….mMmMmM happy valentines day! Cake, with a high ratio of frosting:cake. I love me some sugary frosting! I love the idea of something not too sweet because I really need to get over my sugar addiction. Sounds like a break-time baking project today! I noticed you mentioned NJ-style coffee cake — I recently had a craving for coffee cake and found a perfect recipe that really hit the spot: http://www.karathon.com/new-york-style-crumb-cake/. It is technically NY-style coffee cake, but I think the two are pretty much the same! Sounds like such an awesome day! The cake looks delish…I’m never too tired to make dessert either haha! Totally cookie cake! It’s what I always had on my birthday as a kid. Love that I have a “not so sweet” recipe now! Yum, what a delicious looking treat! I love your desserts! I made your Monster Muffins for my students today and they went crazy for them, they are in love!